Craving for KFC's world-famous chicken? Come over to any of our 280+ stores in the Philippines and we'll serve you freshly prepared fried chicken using Colonel's Secret Recipe of 11 herbs & spices! 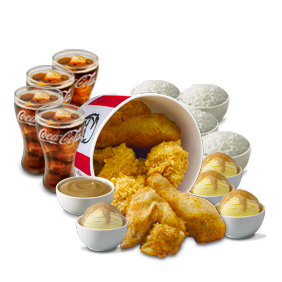 Or order online at www.kfc.com.ph and get your finger lickin' good meals to go or delivered right to your doorstep! A complete group meal of your favorites! Includes 8 pcs. of chicken, 4 fixins, 4 rice and 4 drinks. © 2019 Yum! Ltd. All rights reserved. The KFC name, logos and similar signs are registered trademarks of Yum! Ltd.